Overall leader in the 2019 Dakar, Nasser Al-Attiyah, won the ninth stage of the rally in the car category. It was Al-Attiyah's third stage win of the 2019 edition of the event. On a day on which several other prominent competitors in the event faced issues - including Sebastien Loeb, Stephane Peterhansel and Cyril Despres - the Qatari driver drove well to finish the stage on top. One stage separates Nasser Al-Attiyah from his third Dakar victory. The Qatari driver leads overall by over 51 minutes. Peterhansel was the first to retire, after a crash merely 26km from the start ruined his event. His co-driver David Castera needed to be taken to a hospital in Lima after injuring his back in the accident. Loeb, who won the previous stage, had issues with his car coming to a halt towards the end of the ninth stage. It was an unfortunate turn of events, especially since Loeb led Al-Attiyah by 10 minutes at the final way point. Meanwhile Despres ended up rolling his Mini buggy just 20km to the finish line. Al-Attiyah's was followed by Nani Roma who set the second fastest time of Stage 9, with Giniel De Villiers ending third in the stage. 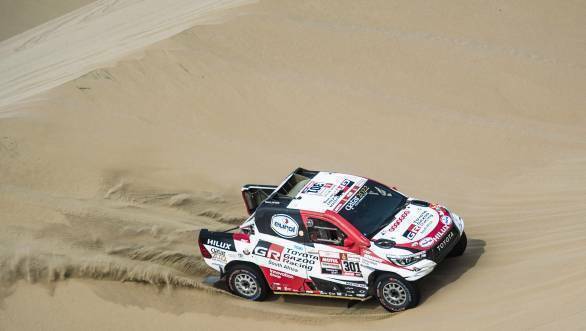 The overall rankings still see Al-Attiyah in the lead of the rally, and very close to scoring his third Dakar win. He is trailed by Roma in second, and Loeb in third place overall. Sherco TVS rider Michael Metge took his maiden stage win in the Dakar, with victory in Stage 9. In the Moto category, it was a surprise win for Sherco TVS rider Michael Metge in the ninth stage of the event. Metge, who has now moved into 22nd overall, ended the stage two minutes ahead of Honda privateer Daniel Nosiglia Jager. Husqvarna's Pablo Quintanilla took third place in the stage. The other Sherco TVS rider, Adrien Metge ended the stage 20th, while Indian rider KP Aravind ended 55th. Adrien Metge is currently 23rd overall, while Aravind is 39th after nine stages of rallying. The overall leader in the Moto category continues to be Toby Price, although, he is a slim 1min 02sec ahead of Quintanilla. Approximately six minutes behind Price is 2018 Dakar winner Matthias Walkner. 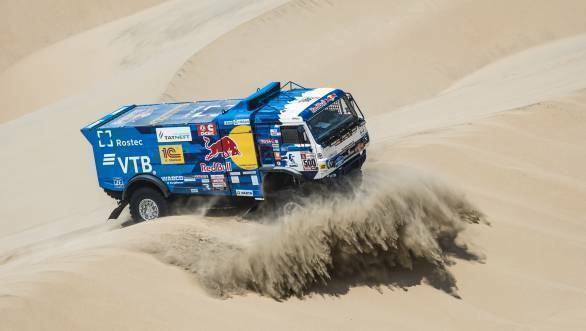 In the truck category, Eduard Nikolaev took victory in Stage 9, which puts him in the overall lead, with just one stage left in the rally, although he is closely followed by his team-mate Dmitry Sotnikov. Reigning champion Reinaldo Varela won the SxS category in Stage 9, while Chaleco Lopez continues in the overall lead. 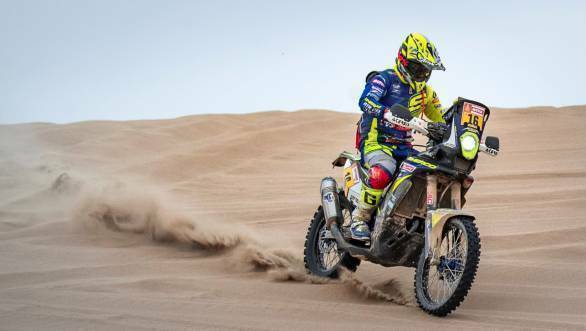 In the Quad category, Manuel Andujar took victory in the stage, while Nicolas Cavigliasso continues in the overall lead.